The Greek Island of Rhodes (Rodos) is the southern most of the Dodecanese Islands. 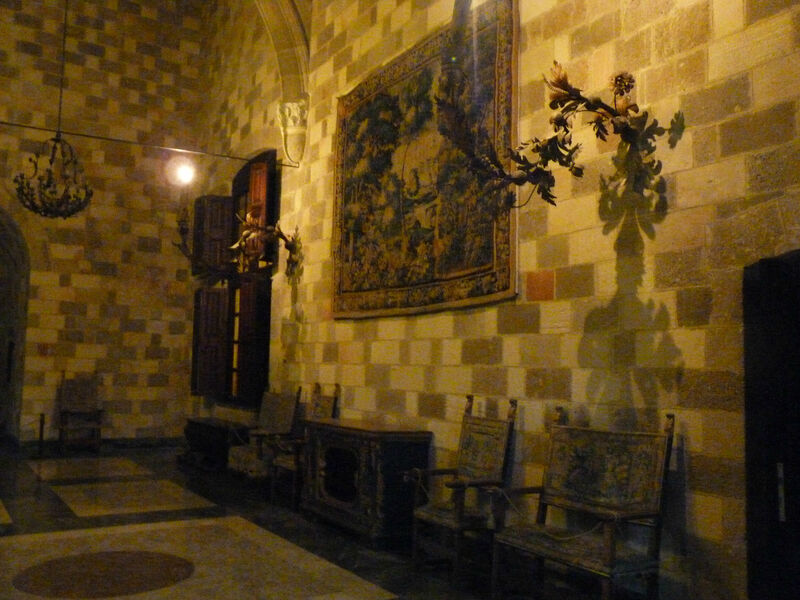 Rhodes has been an important island for many centuries. Located across from what is now the mainland of Turkey, various civilizations inhabited Rhodes through the centuries, the most famous of which were probably the medieval Knight Orders of the Crusaders. 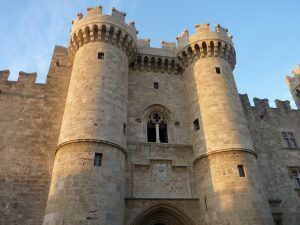 Rhodes is one of the most well known of the Greek islands and vacationers have been going there for decades. Everywhere you will see bars, clubs, and restaurants with food from all over the world, and miles of long sandy beaches. The beaches on the northern side are open to the Aegean Sea and are best for wind driven water sports such as windsurfing, while the beaches on the southern side are open to the Mediterranean Sea, with less current and wind, and are better for swimming and sunning. Rhodes used to be the sun god Helios’ island. According to mythology, he had fallen in love with the nymph Rhodes, and when he shone his light on her, she transformed into the island. The name means “rose” and the island has been known since antiquity as an island covered with flowers, as it is today. It was probably during the Classic period that the Colossus of Rhodes was built with one foot on each side of the harbor of Lindos. After an earthquake it fell apart, but when the people on Rhodes wanted to rebuild it, an oracle told them not to. 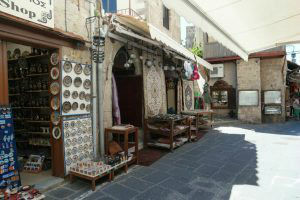 The capital, Rodos, is in itself very beautiful. Just walk around in the Old Town and see where the streets take you. Mandraki Harbor is a nice area, and the hill of Monte Smith provides a wonderful panorama view. Ringed alongside the harbor are many shops selling natural sponges, as the inhabitants of this island along with the Dodecanese Island of Symi, are well known for sponge diving. It is in the harbor of Mandraki the two famous bronze deer stand where the Colossus of Rhodes once was. 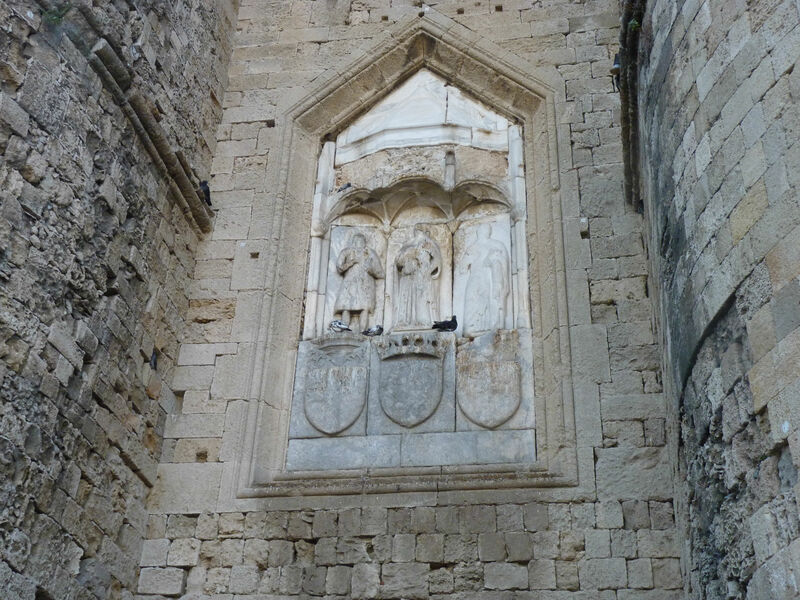 “Old Town”, as it is referred to, is a medieval walled city, once home to the Knights of St. John (the Hospitallers) and subsequent Knight Orders to keep this island as a stronghold for Christianity, for across the way was the power of the Ottoman Empire. The walled city still exists including partial remains of a dry moat, and gated entrances. The crenellated tops of the city walls mark the outline of this old city. Within the walls today is an active city with walking streets, courtyards, and medieval buildings. 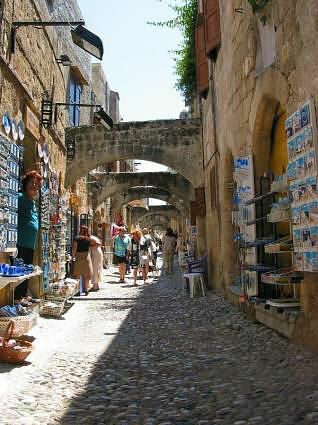 Much of the Old Town is now shops, some touristy and some with elegant Greek jewelry, silver, leather, and couture. Still within the Old Town, and open for tours, is the Castle of the Grand Master, and running in front of the castle, is the road of the Knights, where inns for the various knight orders were once located. Tours are offered of the Old Town. Put aside a morning or afternoon to wander this area, and feel the medieval history come alive. On the southern side of Rhodes, is the Greek village of Lindos, which can easily be visited by yacht, as there is a good harbor here for overnight anchoring. The harbor of Lindos has a nice beach ringed by a variety of Greek Tavernas offering seafood and typical Greek food for lunch or dinner. Lindos village is capped by an ancient acropolis where the remains of a number of buildings from various civilizations and centuries are still to be found. The acropolis originally housed a temple to Athena. Ruins of this temple and the original Hellenistic walls of the Acropolis are still visible. During the Byzantine time period a castle was constructed on the Acropolis. However in the 1300’s, the Knights of St. John built castle walls on top of the Hellenistic walls, along with fortification towers and remodeled the castle so that virtually nothing of the Byzantine era is left and much of the remains on the acropolis now are from the time period of the Knights of St. John, including the church of St. John, which is still standing today. The Acropolis here is felt to only be surpassed by the Acropolis in Athens and can be explored by a short walk up from Lindos village.